When staying at the Alpengasthof Praxmar you can look forward to an adventurous and special farm holiday, which not only your kids will enjoy. At Alpengasthof Praxmar we value and love nature and you can feel this love for nature everywhere: In the lovingly furnished rooms, at the private fish pond, in the Tyrolean parlours, where dishes, freshly prepared with products from our own garden, are served. A farm holiday is always an extraordinary experience for children. This is especially true for the Alpengasthof Praxmar, where all kinds of animals frolic around! Only in a zoo you can gaze at more animals. The whole size adds up to 388 ha, from with app. 9 ha are managed by the family. 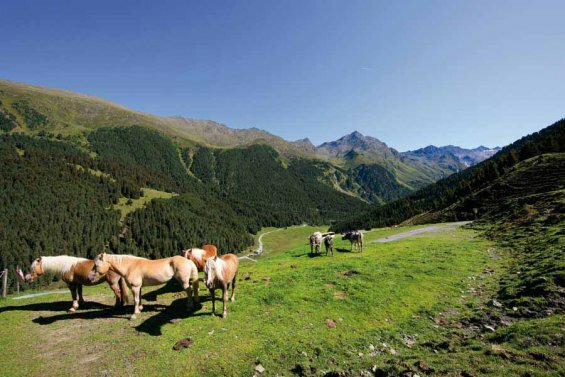 The remaining land is alpine pastures, where app 50 Haflinger horses and about 200 sheep graze. In our stable you can always meet mother cows with their calves as well as pigs. For some years now the family runs its own Haflinger breed (3 Haflinger). Good information for our horse ethusiasts: In the immediate vicinity a horse riding opportunity is available. And that's not all: The private fishing pond is inhabited by a lot of brown trouts and the 1,200 ha big hunting ground is home to numerous wild animals.